I’ve been diligently working to *have* inspiration (as if you can really have it, it just comes…), but nada. You know, write these little plays or moments to share. Anyway, I had some great ideas, but nothing that really grabbed me and was like, “no, we’re not leaving until you wtite us down”. But then I started composing these little poems in my mind, these little strings of words together in my head and going to myseld, “oh hey, that’s pretty good, I like how that sounds or how it makes me feel”. I was about to write one down when another snuck up on me! I had this song in my head and didn’t remember the name, only that there was a chance I’d sorted it into one of my Spotify folders. Sure enough, there it was. Btw, if you get a chance to watch the video (which I just saw for the first time just now), isn’t that strange and beautiful? 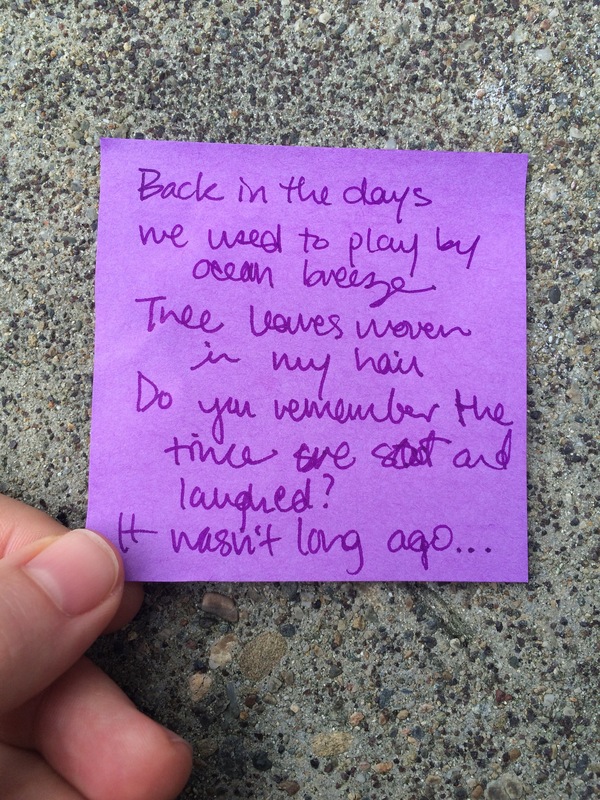 Anyway, I find the song and something tells me to grab a post-it and a pen. Then, poem. Do you remember the time we sat and laughed? So there’s a little something for today. It makes me think of the different songs and words I’ve heard before and make connections. But I also think of the music and the melodies. They are what bring me from one place to another. It takes me longer to learn the words. And so who knows, there’s probably other stuff in the poem above that I haven’t realized are song lyrics from another time when I listened to it before.